At Laminate Works, each employee plays an important role in the quality control process. President Bert Clothier says the people that work for him are one of the most important parts of the company. At Kansas City, KS-based Laminate Works Inc., the message is simple: âWe make parts, only parts.â The company, which has a second location in Dallas, fabricates laminated panels and component parts for the woodworking industry and beyond. Between the companyâs two locations â 100,000 square feet in Kansas City, 55,000 square feet in Dallas and 62 employees overall â it has the capability of laying up 400 panels per facility, per shift. Yet it does not make any finished products. The panels and component parts are packed and shipped off to manufacturers without any kind of assembly. This business model puts Laminate Works in a unique position in the industry. Because the company only makes parts, it serves as an extension of its customers, instead of being considered as a potential competitor, Clothier says. This has opened the door to a broad spectrum of customers. âI could rattle off names all day long where I know my products are used, but at the same token, we donât sell to any of those customers. We only sell to the manufacturers that make the restaurant fixturing, store fixturing, commercial casework, whatever,â says Clothier. In addition to woodworking companies that need panels or components, there are specialized niche markets that the company is able to provide parts to. Clothier refers to these as âwizbits.â A prime example of one of the companyâs âwizbitsâ is a small wooden part for a manufacturer of hospital beds that otherwise include no wooden parts. And because the company has invested heavily in technology, it is able to offer a variety of solutions, such as contour banding, T-moulding, postforming, machining and slatwall. Technology also has been a key factor in maintaining the levels of quality and consistency for which the company is known. Both facilities feature cutting-edge technology, such as this Gabbiani rear load beam saw from SCM Group USA. Thanks to technology, the company can keep customers happy with high-quality and repeatability. According to Clothier, Laminate Worksâ customers are its best form of advertising. Therefore, he takes a strong stance on customer satisfaction and quality. Clothierâs approach to customer satisfaction is a sure step toward success. Despite the troubled economy, Laminate Worksâ sales have been up the last few months when compared to the prior year period. âIn our industry, as well as most industries, they say that thereâs three things that control the decision: price, service and quality,â Clothier explains. âThose are the three things that can make the decision and you can only pick two. For us, we chose to pick service and quality, and focused less on price. It comes as no surprise that maintaining high expectations of quality is a key part of that strategy. Everyone that works on a part or panel has responsibility in the quality control process. If there is an error, it is used as an opportunity for everyone to learn from it. 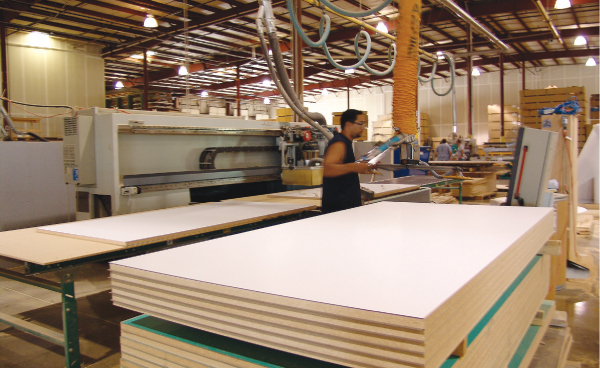 Technology is another strong component of quality â and consistency â at Laminate Works. The company has remained on the forefront of technology. âWe have invested heavily in machinery, both in Kansas City and Dallas. Pretty much everything we have is cutting-edge technology,â Clothier remarks. Both facilities utilize automated glue lines from Black Bros. to laminate the panels. In the Kansas City facility, panels are cut on either a Schelling rear load beam saw or Holzma (Stiles Machinery) beam saw. Also from Stiles, is a Homag BAZ contour edgebander/machining center and a Homag KAL straight line edgebander. The Kansas City facility also utilizes a CMS nested-based machining center, a Topmaster PLC T-moulding machine and a Midwest Automation throughfeed postformer. Most recently, the company purchased two slatwall machines for its Kansas City facility. In addition to the Black Bros. glue line, the Dallas facility features a Morbidelli Author machining center, Gabbiani Galaxy rear load beam saw and Stefani straight line edgebander, all from SCM Group USA Inc.
Over the years, Laminate Works has tried many avenues for advertising to varying degrees of success. The strongest form of advertising has been the customers. Clothier says the companyâs sales force also has been instrumental in building the business. The companyâs sales force, strategically located throughout the Midwest, has helped to build the companyâs brand in the woodworking industry and beyond. Additionally, trade shows have provided the company with good opportunities to tell its story to specific market segments. âGoing to the trade shows makes it easier for the sales people, and I think the customers gain confidence in us in that we are supporting those different trade shows,â Clothier explains. It does not hurt that the company has a striking logo that stands out and is recognizable. âEverything is blue and black; our logo is very strong. When weâre doing our trade show booth itâs all blue, black and white,â Clothier says. âI think weâve done a good job of communicating who we are, and at the same time built some visual identity recognition. âWeâve not only developed a company, weâve created a brand, and I think weâve worked pretty hard to brand Laminate Works so that as we go into other markets, we donât have to define ourselves every time,â Clothier adds. Founded in 1999, the company produces laminated panels and component parts. As a âsolutions company,â Laminate Works partners with its customers to eliminate bottlenecks. 1. Laminate Works makes only components and no finished products, opening it up to a wider range of customers. 3. The company uses state-of-the-art technology to ensure quality and consistency every time.